Are you always striving to be smarter, richer, thinner, _____er? While a drive to make the most of ourselves and be our best is healthy, sometimes that drive can become so narrowly focused that we end up missing out on so much that life has to offer. In the last several years, my “er” has been related to memory. I need to remember everyone’s name in class, and never forget a dance move. If you’ve attended any of my dance fitness classes, you’ve surely seen me blank out on choreography. When I first started out teaching Zumba nearly 6 years ago, for every hour that I taught, I was spending about 10 hours prepping. I was terrified of making a mistake, and super tough on myself when those mistakes inevitably came. Thankfully this is something that I’ve (mostly) overcome, and it’s so much easier now for me to just laugh it off with you all (though of course I work hard to keep them to a minimum). 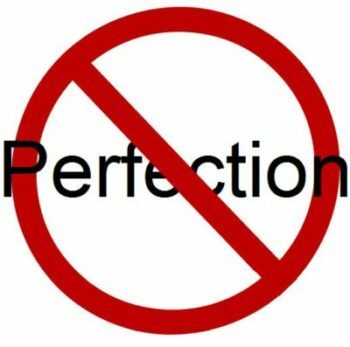 I don’t think we have to consider ourselves perfectionists or type-a personalities to learn to let go of even an occasional need to be perfect. One of the women I like to follow in the fitness industry is Petra Kolber, and she has a really amazing podcast called The Perfection Detox. She’s also given a great 10-minute Ted Talk on the subject. I think my favorite part was around the 7:40 mark – silencing your inner critic. Look to see how far you’ve come instead of how far you need to go. Saying “yes, and” instead of “no, but”. Accepting your mistakes as proof that you’re trying instead of being so terrified of making a mistake that you don’t bother to try. I used to use the phrase “practice makes perfect,” but have recently switched to saying “practice makes progress”. So give yourself a pat on the back for taking whatever steps you took today as you progressed. Learn from your mistakes, give yourself permission to make more tomorrow, and enjoy the journey that is your life.